If there is one celebrity couple that I absolutely love it is Gwen Stefani and her husband Gavin Rossdale (or his music to be precise). Some of you might know her better for the Harajuku Lovers fragrances which were founded in 2005 by Gwen herself. Today I am introducing to you a new limited edition collection of Harajuku Lovers fragrances named the POP ELECTRIC collection. Building on their past success, the much loved and award winning Harajuku Lovers Fragrance POP ELECTRIC collection has five new luscious scents packaged in vibrantly coloured bottles that look like they’ve been dipped in molten chrome. Keeping with tradition, the doll shaped bottles are whimsical pieces of pop art inspired by Gwen's love of modern street art and contemporary sculpture. TOP NOTE: Splashes of Crisp Apple, magical Water Lily, and the sweet surge of Crushed Berries. MID NOTE: Flirty bouquets of Dewy Freesia, whispers of Pink Peony and delicate kisses of Jasmine Petals. BASE: Smooth Sun-drenched Woods, sensual Transparent Musks and luscious Amberwood. One spritz and you get a really light floral fragrance mixed with the crisp apple and it reminds me of DKNY Be Delicious once it has settled down onto my skin. It has great lasting powers too and when I have worn it, not only have people been asking me what it is because it smells so nice, but it has lasted all day whilst I am at work which averages 8-9 hours. LOVE: A mouthwatering fruity floral, featuring juicy apple, dewy pear, surrounded by jasmine, cashmere woods and creamy musks. LIL’ ANGEL: Irresistibly addictive, this fragrance features juicy berries blended with candied violet and sugared rose, laced with a lollipop accord and rich amber. G: A creamy modern gourmand featuring a delectable whipped coconut accord, enveloped in soft florals and musky woods. MUSIC: This vibrant fragrance opens with crisp apples and crushed berries and unfolds into a water floral and wrapped in sensual amberwood and luminous musks. BABY: Soft and comforting, this sophisticated powdery fragrance features a baby soft musk accord which blends with delicate florals and nuzzly vanilla. I love the sound of each and everyone of them and cannot wait to try more from the five. Available in three sizes 15ml, 30ml and 50ml they are priced at £14.95, £24.95 and £34.95 respectively. 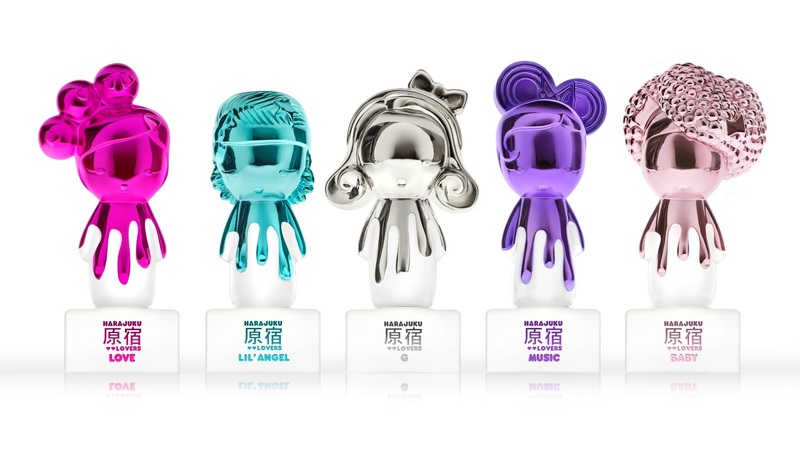 Harajuku Lovers “POP ELECTRIC” are available exclusively in The Perfume Shop from the end of October 2014, then Nationwide from January 2015.
oh wow the packaging of these are soo adorable!! i would get them all just for decoration!! Very original bottles! You need the whole range on your dressing table :) Great price too. The bottles are really cute! They all sound like they would smell really sweet too! Love the pretty bottles , packaging is always fab with the Harajuku range. What cool packaging! not seen any perfumes with packaging like that. Wow most adorable packaging ever! i adore the packaging of these!! aww cute must be hard trying to explain the smell ha smella laptop needs to be invented! Definitely a clever branding there. Those bottles are adorable and I'd want them regardless of whet the scent smelt like! I haven't heard of these before, but now I've seen them I just have to have one! Gorgeous bottles..and I like DKNY's Be Delicious so would probably like the smell of this too. I love these and have collected several different bottles over the years - so cute! Those bottles are just adorable. How utterly cute are those bottles! I would just want to keep them and look. The bottles look so cute. I could do with some new perfume. My partner loves the harajuku series. The packaging on this update is great. Ooh this sooo cool - Hayden saw it and said MICKY MOUSE! Its a really good concept. I've never seen any of these perfumes before and I have no idea how nice they smell but I adore the bottles and want them for that reason alone! I will definitely be smelling them next time I'm in town!